Okay! Musume Time: Idolminded Celebrates its First Year Anniversary! I want to take a little of your time to just tell you that a blog and community I am a part of, Idolminded, is experiencing its first year Anniversary. 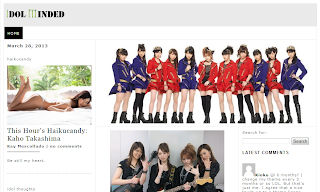 A year ago today on March 28th 2012, Ray opened up Idolminded after deciding to leave International Wota, and at the time that this happened I was already a part of the IW community, so I was surprised that Ray was stepping down, but also stepping up, and changing to a new blog and format. As you may know, I am also a part of Idolminded and have been a part of this community for a year now. I was able to experience the opening of something new and fresh with Ray and was also there to watch Idolminded evolve and become the community that it is one year on, and really, it has been amazing. I created a video dedicated to the first anniversary, as requested by Ray, and in that video I stated that after a year, Idolminded has grown and become so diverse; we have so many distinct voices that are a part of Idolminded now, not just Ray's or my own, and we all create something that is ours and produce content that everyone can enjoy. I have my video's as a part of that content, Thennary has her Nak of It series, there are Haiku Candy's and plenty more including the very helpful and much appreciated Recommended Readings, but even with all of this content I know that Idolminded will continue to grow. There are always idea's flowing and everyone is so on board with what they want to do, and honestly it has been such an amazing experience to be able to write with these amazing people who have been such a big part of the Idol blogging community. Idolminded is just amazing and has come a long way since it first began; it has evolved, and it will continue to evolve, but this is only the first year. We have plenty more to look forward to, and honestly, I can't wait. Happy Cake Day, Idolminded, and here's to many many more! Omedetou!